Mini-DV recording, archiving, editing? This is the professional machine. 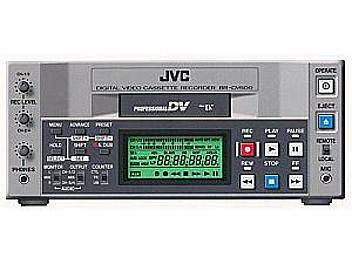 With an editing system that uses the JVC bus (RM-G800U required), assemble editing can be executed using the BR-DV600E. With an RS-422 editing system, both insert and assemble editing can be performed using the BR-DV600E as a player. Available features vary depending on the editing controller used. Also provided is an audio dubbing function that lets you add a new soundtrack (such as narration or music) to the CH3 and CH4 audio channels without affecting the original video or the CH1 and CH2 audio already recorded on the tape. Search with audio is also possible, so you can quickly check for the presence of audio on your recordings. Other pro-level features include a built-in time code generator/reader. SMPTE-standard LTC time codes are recorded frame by frame and can be played back for accurate editing. Time code data input to the rear panel s TIME CODE IN connector can also be recorded. Time code information is clearly displayed on the on-screen display or counter display for easy data control and user bits are also provided. When the GY-DV301E/GY-DV300E is connected to a BR-DV600E recorder via the DV connector, the BR-DV600E will start recording 5 minutes before the tape ends in the GY-DV301E/GY-DV300E. This allows continuous shooting without interruption for extended periods.